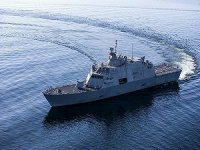 The first of two newbuilding Robert Allan design 40 tonne bollard pull, ASD tugs, which Marcon International, Inc. of Coupeville, Washington announced last year, has been delivered by Sanmar Shipping, Turkey to Remolcadores Dominicanos of Santo Domingo.. 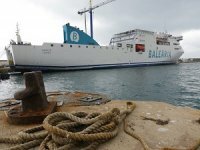 The first of two newbuilding Robert Allan design 40 tonne bollard pull, ASD tugs, which Marcon International, Inc. of Coupeville, Washington announced last year, has been delivered by Sanmar Denizcilik Makina of Tuzla, Turkey to Remolcadores Dominicanos of Santo Domingo, Dominican Republic. 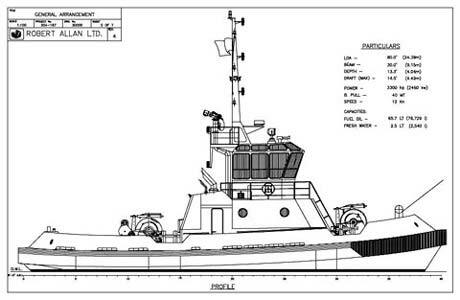 The 24.39 m x 9.1 m x 4.0 m Ulupinar series tug Haina is powered by a pair of CAT 3512T TA diesels developing a total of 3,300 bhp at 1,800 rpm to US-155 FP azimuthing drives from Rolls-Royce. The RINA classed tug is also fitted with Rolls-Royce hydraulic towing winches fore and aft, Data hydraulic 8-inch retractable tow pins and a Data hydraulic 45 tonne SWL tow hook. Two Perkins generator sets each provide 74 kVA electrical power. 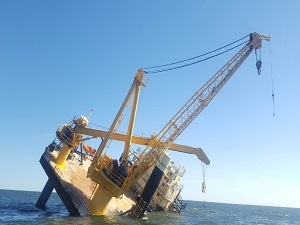 The new owners plan to sail the tug on its own bottom from Turkey to Santo Domingo, where it will be employed in ship assist work. A representative of Marcon attended the hand-over of the tug in Tuzla. 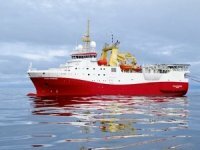 Delivery of the second tug is scheduled for the first quarter of 2009. 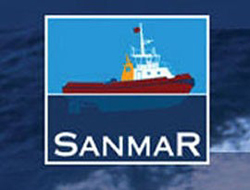 Sanmar, still a family run firm, was founded in Istanbul in 1978 to operate tugs, mooring and pilot boats of the BOTAS Pipeline Corporation located in south of Turkey, on the Mediterranean. 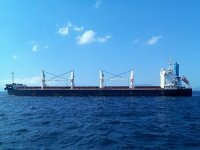 The firm first became involved with new construction in 1982 and the first tug of Sanmar's own fleet Sanmar I was built in 1990. 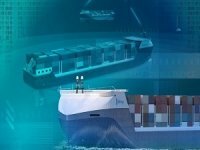 Sanmar can build tugs to suit any customer requirements, marrying its own skills with those of international naval architects such as Robert Allan Ltd. of Vancouver, Canada. 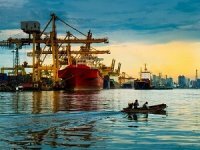 Sanmar-built vessels fully meet the highest international standards and comply with the rules and regulations of the many various international classification societies. Remolcadores Dominicanos is a 35-year old, privately owned harbor and deep sea towing company operating a fleet of twelve single and twin-screw tugs between 400 and 3,300 hp, three line-handling launches and an 11,000 bbl fuel barge, based at ports in the Dominican Republic, offering coverage of the Caribbean Sea, the Southern Bahamas Islands and adjacent North Atlantic waters. Founded in 1973 in the port of Santo Domingo, Dominican Republic by two leading shipping agency firms (Baez & Rannik and Frederic Schad), Remolcadores Dominicanos began life with one 1,200hp World War II ex-Navy diesel-electric single screw tug, the "Saona" (ex-YTB 389). This tug served reliably until the end of 1989, when it was sold for scrap. Marcon has sold Remolcadores Dominicanos several tugs and barges over the years.